At 21 weeks (over halfway to meeting our little boy! ), I don’t feel like my eating habits have changed a ton. I’m eating a little bit more and a little bit more often (plus giving in some salty cravings) but I’m still focused on getting in lots of vegetables and eating what sounds good to me. So let’s get into what I ate during the day on Monday! Breakfast has not really changed for me in the two years since I started this blog, it’s typically oatmeal and always coffee! I’m so glad that I can drink my full cup of coffee again since I had to downgrade to a smaller cup during the first trimester. It was just causing so much heartburn but (so far) that hasn’t come back again. I’ve been mainly switching between PB&J oatmeal (using frozen berries) or golden milk oatmeal in the morning, depending on what I’m thinking about eating the rest of the day. If my lunch or dinner won’t have a lot of vegetables in it, I’ll usually go for the golden milk oatmeal which has shredded carrots. But this morning, I needed some peanut butter! One big change to my eating habits is that I’ve added in a morning snack (and sometimes an evening snack). I just can’t make it to lunchtime without my stomach growling if I don’t have a snack. My go-to lately has been plain greek yogurt with homemade granola (from Run Fast. Cook Fast. Eat Slow.) and a banana. It’s something that’s super easy to eat while I work and easy to pull together in the morning. Leftovers for lunch which is pretty normal during the week. Mike’s been doing most of the cooking which has helped out a ton since by the end of the day, I’m pretty exhausted. Today’s leftovers was copycat PF Chang's Mongolian Beef over rice with mixed beans and string cheese on the side. If I’m having the main dish that doesn’t have any vegetables in it, I try to have vegetables on the side just to make sure I’m getting in a variety of vegetables through the day. Since January, I’ve been having a different version of the superhero muffins from Run Fast. Cook Fast. Eat Slow. I’ve had the beet and blueberry ones, the apple and carrot and the pumpkin ones. Right now, I’m working through a batch of carrot and mini chocolate chip muffins. They are super easy to keep in the freezer and pull out one in the morning to thaw plus it’s another serving of vegetables. 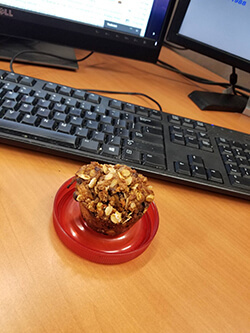 These muffins also make a great pre-workout snack (I haven’t found it bothers my stomach on runs or before cross-training sessions) and I know they’ll be great to have on hand once baby boy comes and I need something easy to eat with just one hand! Leftovers once again and another recipe from Run Fast. Cook Fast. Eat Slow. I seriously love this cookbook! Dinner involved a ton of vegetables since it was Veggie Lover’s Pasta Salad that we added in chicken breast to make it more filling for us. There is a ton of this salad leftover and the longer it sits in the dressing, the more delicious it gets. Plus it’s nice to have a cold meal on hand since we’re getting warmer weather and I don’t really feel like a lot of hot soups or heavy dishes anymore. I don’t always have a snack before bed depending on how early I eat dinner. Sometimes I need to have something so I don’t wake up with a growling stomach at 2 am (and sleepily walk to the kitchen for a spoonful of peanut butter). And sometimes, I just need to take care of a salty craving. Tonight was fulfilling a craving so I made myself some easy nachos with tortilla chips and cheddar cheese. Before pregnancy, I wasn’t a huge chip person but now I find myself snacking on chips a lot. And the saltier the better!